I love this vintage recipe for chocolate mayonnaise cake. These are moist and stay for days fresh the problem is they don't last long on our table! One of my all time favorites recipes. 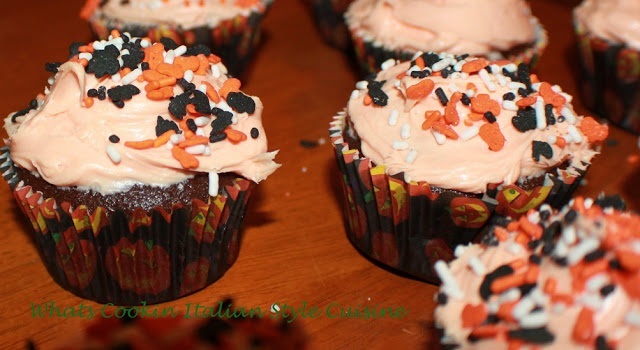 I used my old time recipe batter for making cupcakes this year for a Halloween festive treat. You can use canned or homemade frosting. The kids will love you for these! Mix all the above cake ingredients beating with an electric mixer for 3 to 4 minutes then pour into paper lined cupcake tins. You can also use a bundt pan or 13x9 sheet cake pan that is heavily greased. Bake at 350 until toothpick comes clean in middle around 35 to 45 minutes. Cool 10 minutes . Garnish and decorate however you like. Optional: Food coloring of choice. Either use gel orange coloring or regular food coloring to make orange use red and yellow. Beat all together all ingredients together. Add food coloring to get orange I used 1 drop red and 3 drops yellow. Using mayonnaise to make cupcakes is new to me. They look very festive and beautiful, Claudia.